This Museum Collection wall tapestry shows To My Sole Desire, which is part of The Lady and the Unicorn (French: La Dame à la licorne) a series of six tapestries woven in Flanders from wool and silk, The set, on display in the Musée national du Moyen Âge (former Musée de Cluny) in Paris, is often considered one of the greatest works of art of the Middle Ages in Europe. Wow, this tapestry is not only beautiful to behold, but it's clearly made with quality materials and craftsmanship. I absolutely love it. I wish I had more wall space so that I can display more of your fantastic work. Thank you! Absolutely beautiful tapestry. Shipped very quickly. Could not be happier with this purchase! Thank you! 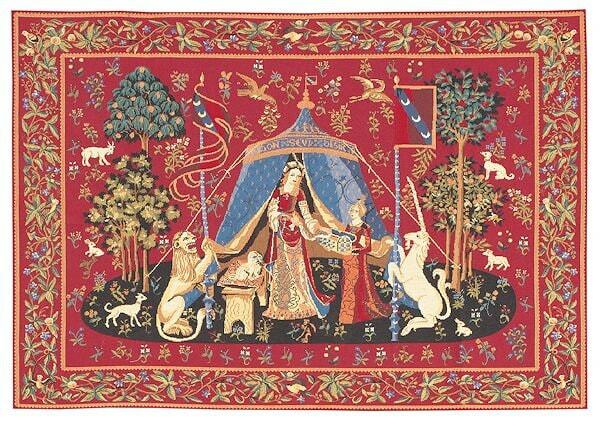 This tapestry is as beautiful as seen in the online image. The weaving is excellent, and the arrival was surprisingly fast considering it traveling from Belgium. I can't be more satisfied. I know I ll buy more for sure. Thanks a lot.